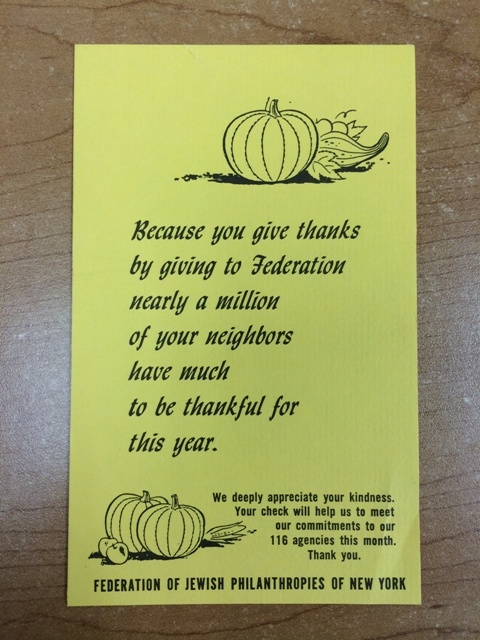 Federation took the occasion of Thanksgiving to ask its constituency to consider donating, as evidenced by the following graphic materials found in the Public Relations series. Dating back to the 1950s and 1960s, these slips of paper would have been inserted into mailed items. 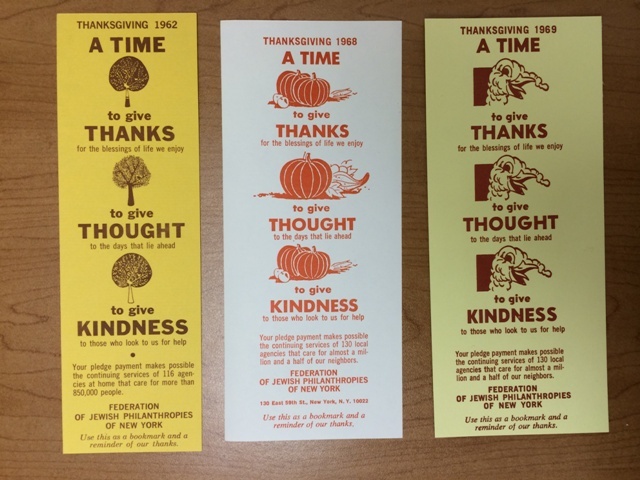 Thanksgiving mail inserts from the FJP Public Relations, 1960s. Thanksgiving mail insert from the FJP Public Relations files, undated. In the 1970s and 1980s, the national office of UJA participated with the government of Israel in many fundraising campaigns; fundraising for Israel was, after all, a large part of UJA’s mission. UJA offices in local communities, like UJA of Greater New York in our collection, participated in these campaigns, raising money from their local donors. As part of the Israel Education Fund, UJA of Greater New York solicited donors who could fund schools or classrooms in specific communities in Israel. 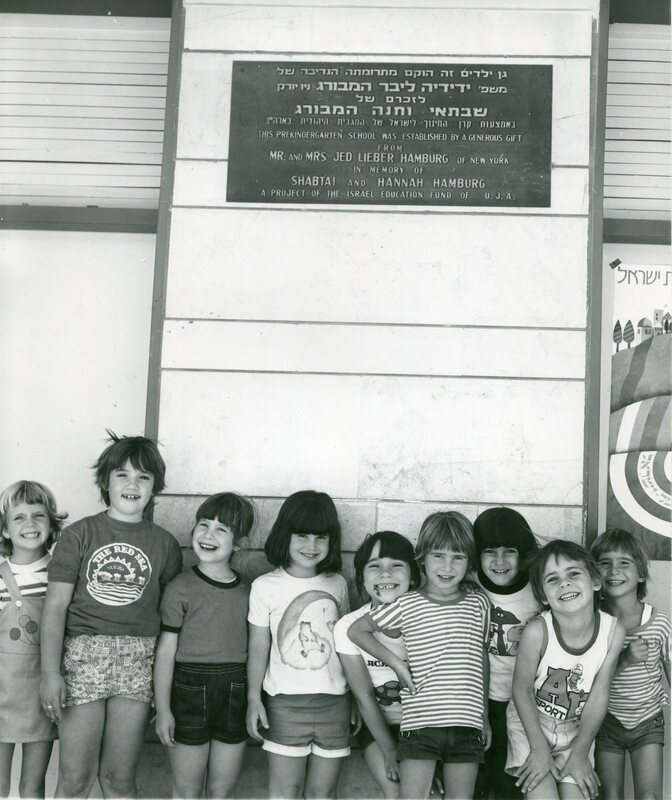 The fundraising files of Henry C. Bernstein from about 1971 to 1981 indicate that many of these buildings and classrooms were for pre-kindergartens. In a striking connection with Israel’s commitment to early childhood education, Bill De Blasio campaigned for mayor of New York City in 2013 on a platform that included universal pre-K; this fall many new pre-K classrooms opened with city funding. 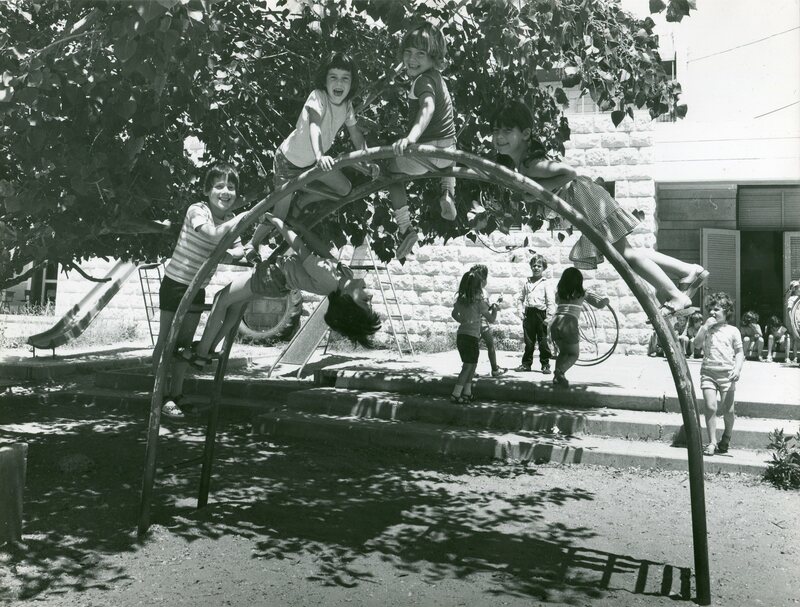 The images below are from one of Henry C. Bernstein’s donor files and are from about 1980 – Israeli children playing at their new school, funded by generous donors to UJA of Greater New York. In a subject file on Jewish Board of Family and Children’s Services (JBFCS) that is part of the Joseph Langer material, UJA-Federation’s Director of Community Development and Neighborhood Preservation, I found a packet of material that was provided to volunteers in the Friendly Visitors to Soviet Jewish Refugees Volunteer Program. The program helped train volunteers to visit and accompany refugee families to stores, businesses, tourist attractions, and synagogues. Through these and other activities, the volunteers aided families with their resettlement and adjustment to the New York area. From the late 1980s well into the 1990s, many UJA-Federation-affiliated agencies, including JBFCS, were developing and offering services to cope with an influx of Soviet emigres finding a new home in the metropolitan New York area. Federation services and programs included assistance with housing, job placement, education, and child care. As Director of Community Development and Neighborhood Preservation, Langer would have received the packet—proof of his assistance with the coordination and funding of services and programs through neighborhood-based Jewish community councils in Crown Heights, Canarsie, Brighton Beach, the Rockaways, and other neighborhoods. 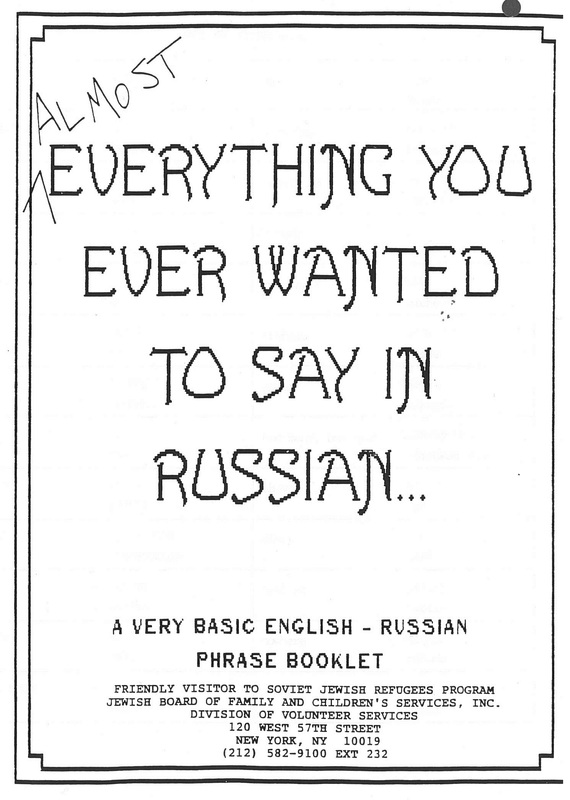 In the packet, there is also a very basic booklet to guide a volunteer in the JBFCS program with English to Russian transliterated phrases. For instance, if a volunteer was late meeting up with a refugee family, the volunteer could offer an apology, “prostite chto opozdal” (forgive me for being late) and then “rad vas videt” (I am glad to see you). If a volunteer preferred the New York Mets to the Yankees, the volunteer could remark to a Yankees fan that “ya ne soglasen s vami” (I don’t agree with you). Although the phrase booklet is very basic, it would likely have been very helpful for facilitating some communication between the volunteer and the newly arrived Soviet Jewish refugee family. And if the phrase booklet was not, in fact, very helpful, perhaps the volunteer could explain that “ya ne vinovat” (It’s not my fault), “ochen zhal” (I am very sorry), “ya ne govoryu po ruski” (I don’t speak Russian). In addition to the Joseph Langer files that I am processing, another project archivist is concurrently processing a large chunk of archival material related to special funds procured by the Federation of Jewish Philanthropies for Russian resettlement. Within these files, there should be some additional details about the services and programs that Federation provided to Soviet Jews before Federation’s merger with United Jewish Appeal of Greater New York. After more archival material has been processed, described, and made available through our finding aid, we want to invite researchers and those interested in the UJA-Federation of New York Collection to “prihodite pozhalusta k nam” (please come and see us). Rabbi Isaac Trainin started Federation’s Commission on Synagogue Relations and Religious Affairs Committee, and remained as head of the Commission for several decades. (To see previous blog posts on Rabbi Trainin and his work at Federation, search the blog on “Trainin”.) While processing his papers, the names Victor Wouk and Herman Wouk turned up. Although the records are incomplete, it appears that Victor was chairman of the Religious Affairs Committee at some point in the 1950s and 1960s. Herman was his brother, the author whose book, “This is My God”, sat on the bookshelves of many Jewish families in those decades. 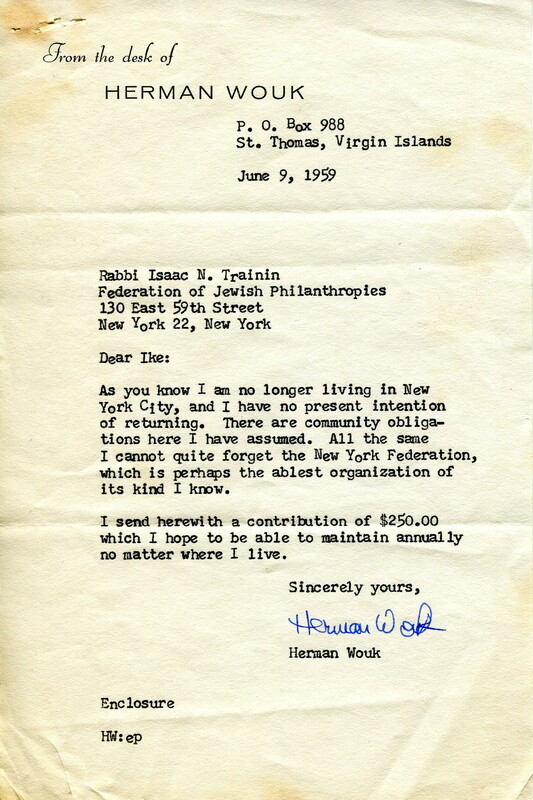 It is no doubt because of Victor’s connection to Federation, and to the Commission on Synagogue Relations, that there was an attempt to pull Herman into the Federation family as well. Victor, younger by 4 years, was successful in his own right. His obituary in the New York Times, June 12, 2005, describes his work in developing early electric and hybrid cars. He was born in the Bronx in 1919 and received his doctoral degree from the California Institute of Technology in electrical engineering in 1942. His connection with Federation extended beyond the Religious Affairs Committee. According the New York Times, Victor was an “active philanthropist”, a board member of the 92nd Street Y (a Federation agency), and a “chairman” of the Federation of Jewish Philanthropies (presumably the chairman of an FJP committee). Victor died in 2005. In addition to “This is My God”, Herman Wouk is perhaps best known for his novels “The Caine Mutiny” (1951) and “Marjorie Morningstar” (1955). His most recent novel, “The Lawgiver”, was published in 2012.